This yeasted apple streusel cake is less sweet than your typical coffee cake. The cake itself is quite light and is enhanced by the crunch of the streusel topping. I’d intended to make it for an afternoon snack, but the day got away from me and I ended up serving it with dinner. 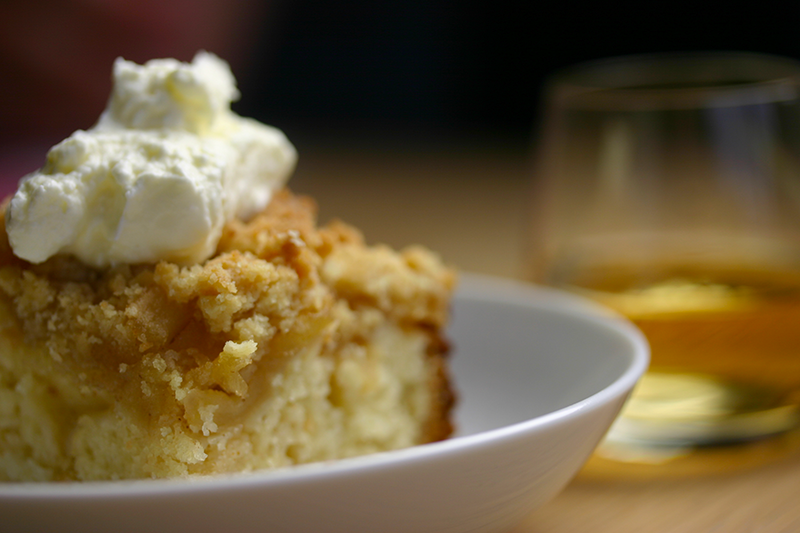 The apple streusel cake recipe I followed comes from the For Love of the Table blog. Warm the milk, then stir the yeast into it. In a mixing bowl, combine the milk, butter, egg, egg yolk, half the flour, sugar and salt. Beat until smooth, then fold in the remaining flour. Transfer to a buttered bowl, cover with clingfilm, and leave in the fridge overnight (or for up to 24 hours). To make the apple compote, melt the butter in a frying pan over medium heat. Add the apple, and sauté until softened. Add the sugar, cinnamon and lemon zest and cook until melted and bubbling. Remove from the heat and cool. Store in the fridge until ready to bake. To make the streusel, combine the flour, sugar and butter. Store in the fridge until ready to bake. Butter a 9×9″ pan. On a lightly floured surface, roll the dough into a 9×9″ square, and transfer to the pan. Cover and allow to rise for an hour. Preheat the oven to 400°F (200°C). Dimple the surface of the dough, then spread the cooled apple compote evenly across it, pressing pieces of apple into the dimples. Scatter the streusel evenly over the compote. Bake for about 30 minutes, or until the dough is risen and firm and the surface golden.